To paraphrase our beloved James Baldwin: the world is held together, really the world is held together by the love and compassion and clarity of thought of a very few individuals. Though this idea may be frightening, the world being in such distress, it is also comforting. At least there are a few people who can be counted on to lead us in a proper direction for survival as humans, and for thriving as a species. Aung San Suu Kyi is at the top of the list. That is really the reason she is jailed and on her way to being imprisoned in Insein Prison, in Burma, where conditions are notoriously horrific and from which inmates often emerge, if indeed they do emerge alive, broken and in need of things like wheelchairs. What can we do? 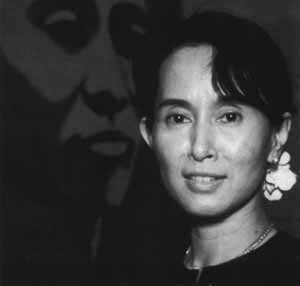 I can’t think of anything more important than Aung San Suu Kyi’s struggle, which she is waging so brilliantly. She has proved she is not afraid of death, and one feels imprisonment will be to her - as being jailed was for Martin Luther King - simply part of a necessary pilgrimage of the soul. I am not as concerned about her, to be honest, as I am about the rest of us. We need Aung San Suu Kyi. We need her example of integrity, courage, a raging and revolutionary loving kindness that has kept her steady in her long years under house arrest. It is amazing to think of the discipline she has taught herself over these years: to see through the masks of even the most brutal dictators, and to discern the confused, unwell, frightened persons behind the masks. To say, even after years of house arrest: I would hope one day to be friends. I would sit down and talk with them. It is up to the citizens of the world to free Aung San Suu Kyi and all Burma’s political prisoners, as well as the country of Burma itself. Our governments, bogged down with the accumulated mistakes of the past, and burdened by their own entanglement in greed, are not likely to be sufficient help, even when they are willing. We must remember as we look about the planet at people like ourselves who are oppressed and discouraged, that we are the majority. Sometimes the feeling of being very small in so large a scheme of suffering hinders us. But, take heart. Before the ice at the polar caps completely melts and we are all submerged, along with our dreams, we can do a lot. Especially if we can commit to do even a little. Once someone pointed out to Sojourner Truth how insignificant she was; a black person, a woman, recently enslaved. To paraphrase her acerbic rejoinder: If I’m only a flea on the back of the stubbornest mule on earth, by God I intend to keep him scratching.